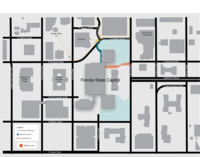 It is the goal of DMS to minimize the impact Capitol grounds construction may have on employees and visitors and to inform the public and affected stakeholders about the repair work and potential impacts. This website will provide updated information about road closures, changes in traffic patterns, any unforeseen challenges in the construction process, and other pertinent information to allow the public to stay informed and plan accordingly. The first sign of progress is construction fencing, which will be visible throughout the projects. While this may affect pedestrian traffic routes, these measures are designed to provide safety for those in and around the Capitol. There will be times when roads, or lanes of roads, will need to be closed. DMS is aware that any closure is an inconvenience for drivers and pedestrians, and crews will be diligent about limiting these disturbances. Additionally, DMS will work with city and county departments to ensure the public is informed about potential impacts. Please use the following maps to determine routes for accessing the Capitol’s security entrances on Monroe and Duval streets. In addition, you can find further information under the Visitors and Construction Closures tab on this website.